This is the Original Termite Trap, a world first invention created by an Aussie entomologist and former pest controller. Beware of inferior, untested imitations. 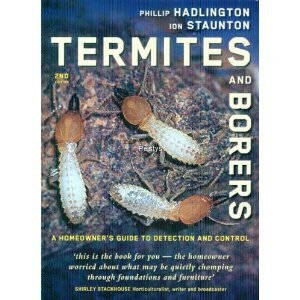 Created for Australian conditions by Entomologist, TAFE lecturer and pest control textbook author Ion Staunton. 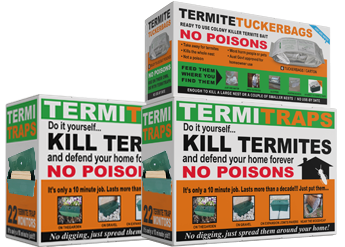 It uses a system of bait and monitors – the same strategy that professional pest controllers will use. It takes 10 minutes to set up and lasts for years. This 12-Pack plus 6 Tuckerbags of bait is for homes on smaller blocks up to about 400sq meters. Spacing them further apart on larger blocks can lead to big gaps between Traps through which termite scouts might find a way into your home. WARNING – The $180 you save buying the 12 pack might result in damage many times more costly than that. 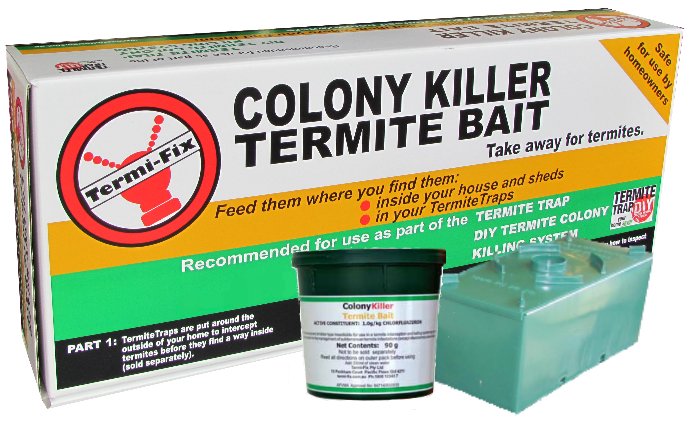 Registered for homeowner use by the APVMA in Canberra, use these baits to kill the whole colony and remove the termite threat. 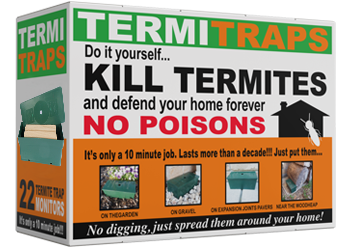 Deadly to termites but 100% non toxic to you, your family and pets. What you don’t use will keep for many years. Enough in a carton to kill a large colony or a couple of smaller colonies. You can buy the traps on their own and bait later when you need it. Place them on your garden, on pavers, over expansion joints about 3 metres apart. No digging. There are 22 in a carton; putting them around is a 15 minute job. Easy to check as you walk past and easy to add bait when required. 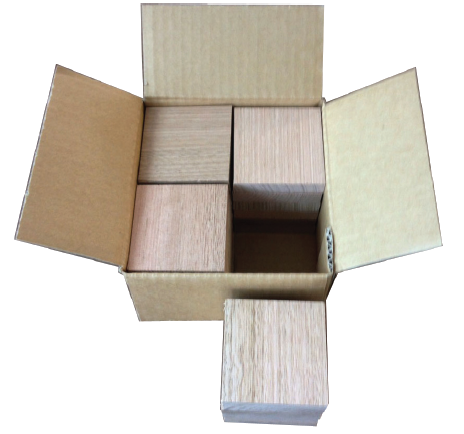 This 12-Pack is for homes on smaller blocks up to about 400sq meters. 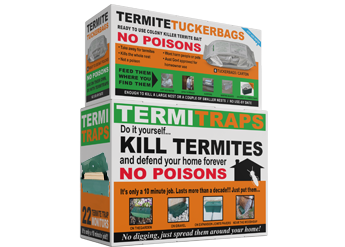 Spacing them further apart on larger blocks can lead to big gaps between Traps through which termite scouts might find a way into your home. WARNING – The $180 you save buying the 12 pack might result in damage many times more costly than that. We’re so confident that you will be delighted by the quality of our products and the helpful advice from our team that we offer a full no-nonsense, no-questions-asked refund guarantee. 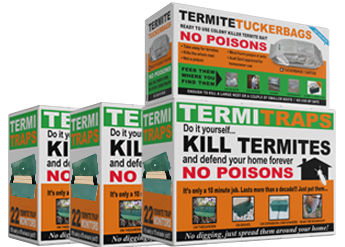 Don’t spend money trying to kill nuisance termites. Only a few species attack the solid timber in buildings. 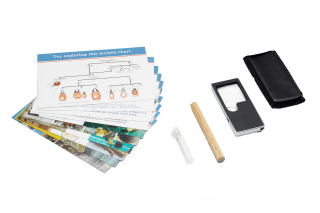 This ID Kit will help you to sort out which is which. 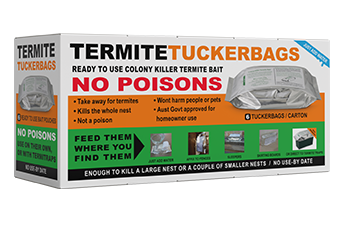 The Termite Trap Colony Killing System is for surburban homes, 2:1 Kit is for those who may live on acreage and have sheds to protect. The 3:1 Kit is for properties with many sheds, stables, stock loading ramps, etc. There is 1 carton of Bait with each kit. 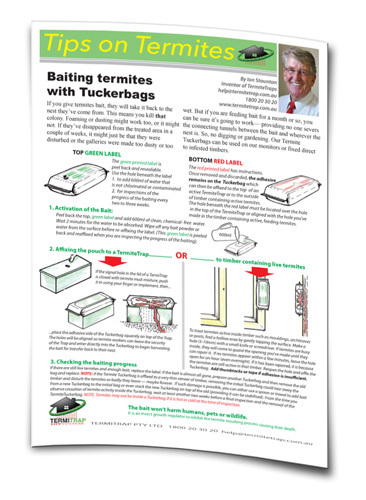 You won’t need bait until you have live termites and you can always buy more when needed. There are 10 tubs of bait in a carton. 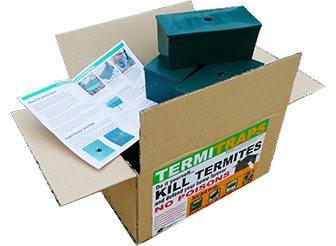 Only for use with the ribbed top termitetrap monitors. 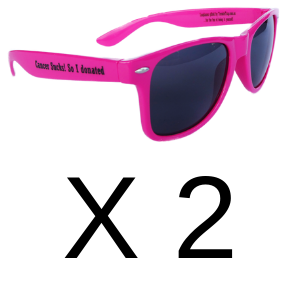 UV protection squint prevention they shout out that you support cancer research $25 incl GST and postage And… you will be noticed. Anyway, it’s not the sunnies… it’s the donation you make! 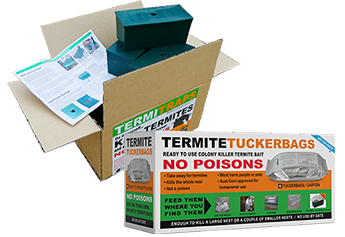 The inventor of these products Ion Staunton, is a former pest controller, TAFE teacher and wrote the textbooks used to train Australia’s professional pest technicians.